Your business is growing. And as you get more customers and build your team, you find yourself spending more and more time in the office dealing with the same problems again and again. You probably haven’t spent enough time systemizing the critical processes in your business. If you find yourself dealing with the same issues more than once a week, it means you haven’t created a system for those issues. 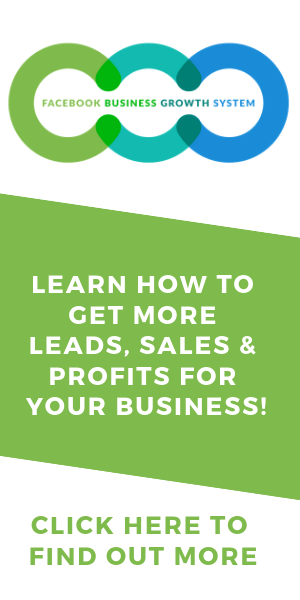 In this blueprint, we’ll show you how to systemise your business and run like a well-oiled machine so you will have more time and energy to focus on the more important parts of your business. You can use this to start systemising the processes in your business. You can use this to improve on the existing systemisations in your business. You can share this blueprint with your team so they can help you to keep systemising and improving different parts of your business. 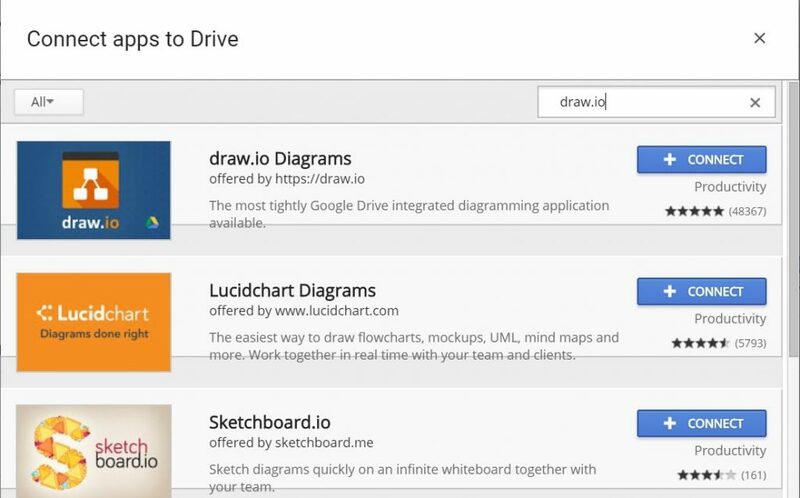 The main tool you’ll be using is Google Drive and Draw.io. You’ll be keeping your systems organized in a free Google Drive account. It also allows you to easily share your systems with your team members. 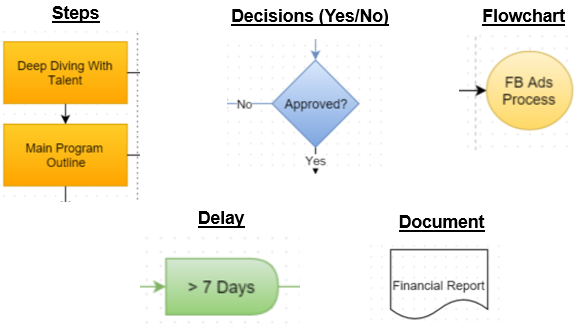 Draw.io is the main tool we use to create flowcharts of our processes. It comes as a free app with Google Drive but you need to install it to your Google Drive account. A system is a network of interdependent components. They work together to try to accomplish the aim of the system. This is why it is crucial for a system to have an aim. Without an aim, there is no system. In the context of a business, systems are processes that enable your business to produce results consistently for you and your clients. Systemising processes frees up your team members from being stuck doing low value creating activities. These type of tasks are usually of an administrative nature and tend to be repetitive. Nevertheless, they are still important for the day to day operations of your business. By freeing up your team members from such activities, they will have more time to work on tasks that contribute more to your business’s growth. 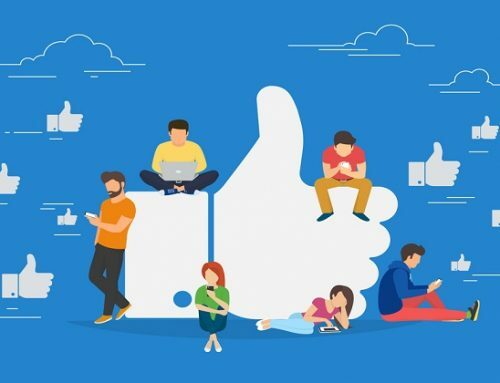 This helps them to feel more empowered too as they will feel like they are contributing to something bigger and making an impact on your business. With tested and proven systems in place, it will be faster when you are teaching a new team member. The systems serve as a straightforward and step by step guide for him to learn, follow and execute. In addition, if he’s unsure, he’ll be able to refer to past data for guidance if the system has been running for some time already. This links back again to the fact that systemisation creates structure in your business processes. Once you’re done with one part of the process, you know exactly what is going next and so on. With systemisation, you also develop expectations that certain outcomes will occur. This predictability also allows all your team members to be on the same page as they will always know what is going on. Once your systems are in place, you will be able to scale up much faster than ever before. When it comes to operations, you will have a reliable way to consistently deliver on your promise to your customers. If you want to serve more customers, it’s just a matter of scaling up your systems in your operations. When it comes to sales and marketing, you will have multiple processes to get leads, turn them into sales and get them to buy more. 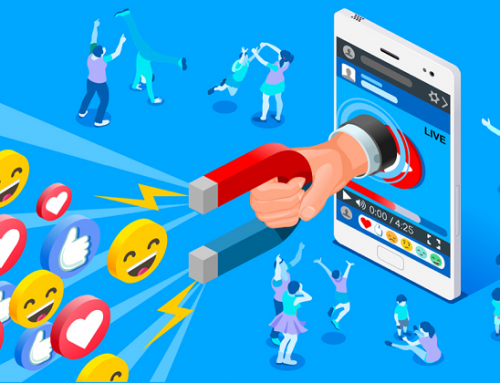 When you want to get more customers, all you have to do is to “turn on the tap” and get a flood of new customers. You’ll be able to achieve the same result with less time and effort. 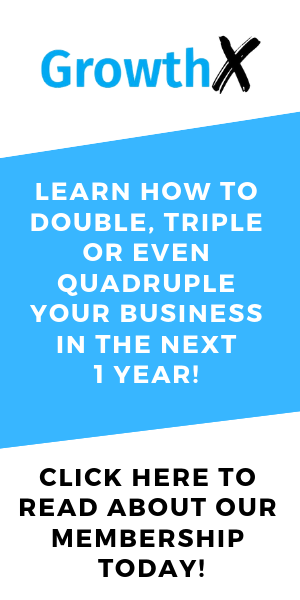 And when you can shift your focus to more higher value activities such as networking, training your team and looking for more opportunities, you’ll be able to grow your business exponentially. 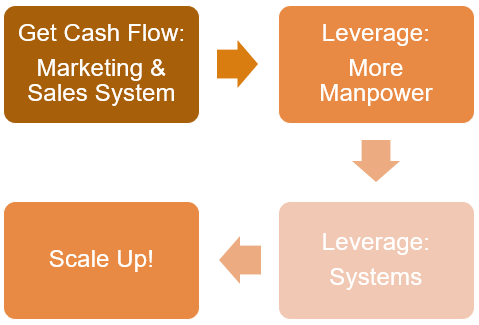 When you are at the early stages of your business, your main focus will be to get cash flow to at least breakeven. 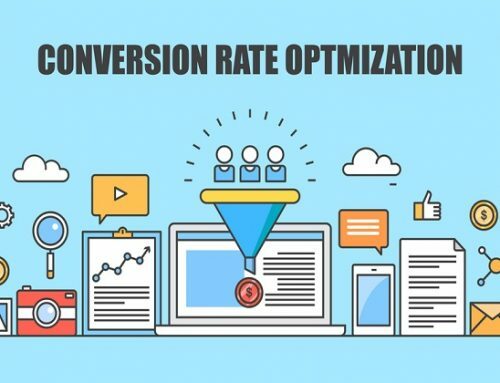 This is when investing in marketing and sales system will help you to focus on generating revenue instead of the daily repetitive tasks. As your business grows, there will come a time when your output is limited by the manpower that you have, so the next step is to expand your team. When you have new employees, having systems in place means that can be up to speed quickly and start performing as early as possible. When you intend to scale up, systems will be the key to ensuring that you have a strong foundation for your business, so you can focus on the higher value creation activities. 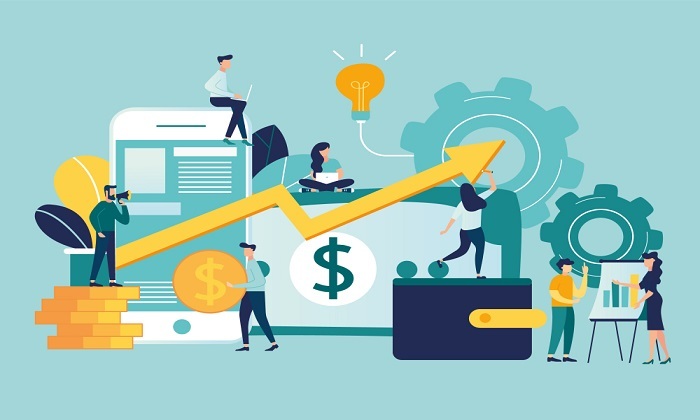 So as you can see from the above, systemising begins from the very first day of your business as it has an impact on different parts of your business’ growth journey. This is the reason why you should start systemising today! If not, you may face challenges in the future which may slow down your business’ progress. A flowchart is a diagram that shows the sequence of events/actions that occur in a certain process. It shows you how a process works. This is especially useful in giving you a clear breakdown of all the steps that need to be taken to achieve the aim of the process. A flowchart is also useful in knowing the progress of a certain process because you can tell which point of the process someone is at with just one look at the diagram. 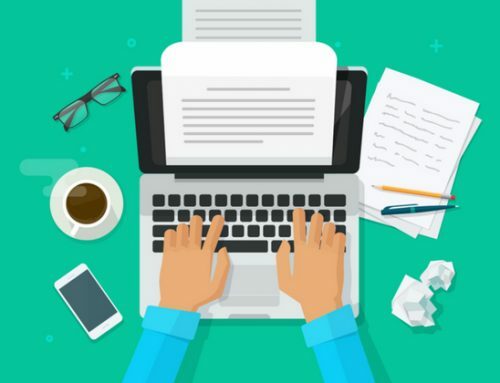 A template is a pre-formatted piece of document that serves as a model that users can follow to carry out a certain function. It usually comes in a plug-and-play form. It can come in a piece of form such that the user just needs to fill in the blanks. Or it can be an outline that users can replicate and apply easily to perform a certain task. There are usually samples attached to demonstrate how the template is used to achieve the final outcome desired. If required, the template may contain a set of instructions on how to use it as well. This document contains questions you can ask another person or yourself. It is useful for strategic thinking and planning. This provides step by step information that helps readers to achieve a specific goal. It is essentially a guide. The key is to provide as much information as possible so the user only needs to refer to it to achieve a certain goal. 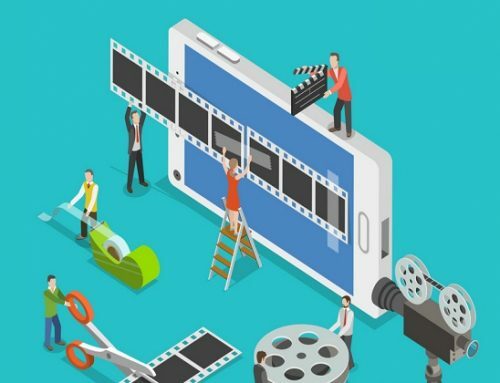 In general, visual guides tend to better than videos as it’s faster to refer to and use. This type of documentation is especially useful for training new team members on technical tasks. Our blueprints are an example of this. Here’s an example from our Blueprint Library. 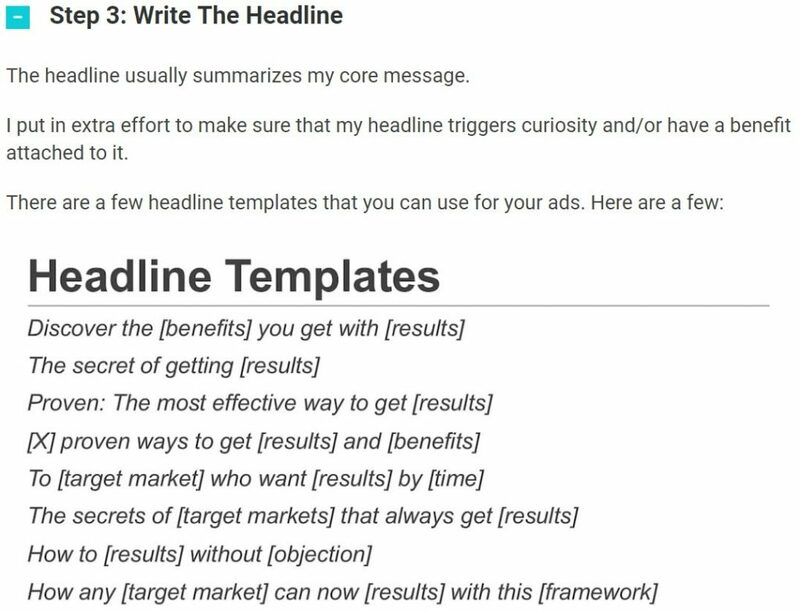 We created a guide on how to write ad copy. 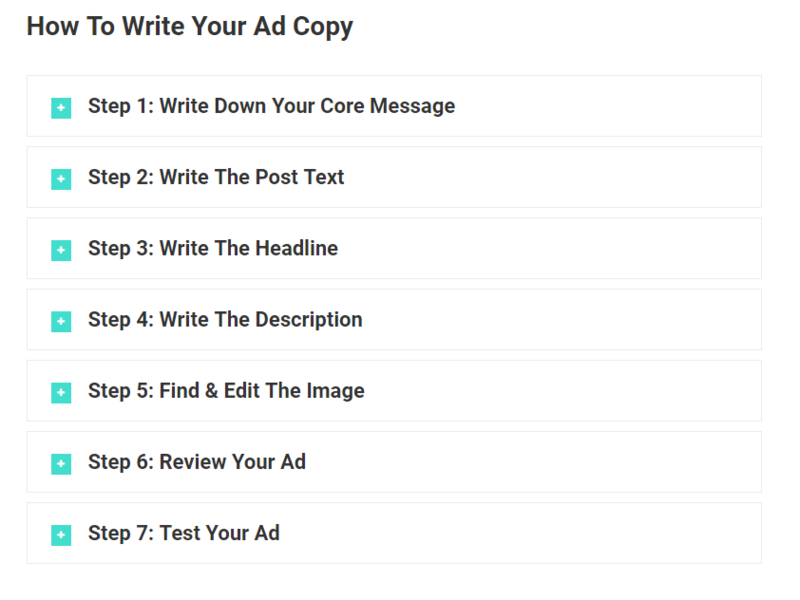 All our new team members will go through the same blueprint if they want to pick up ad copywriting as quickly as possible. A checklist is useful for ensuring that certain elements of a task are in place. Hence, they are usually used as a control. That’s why most checklists are often created for the end of the process to make sure that everything that needs to be done has already been executed. An example of this is our ‘Fix Your Campaign Checklist’ blueprint. 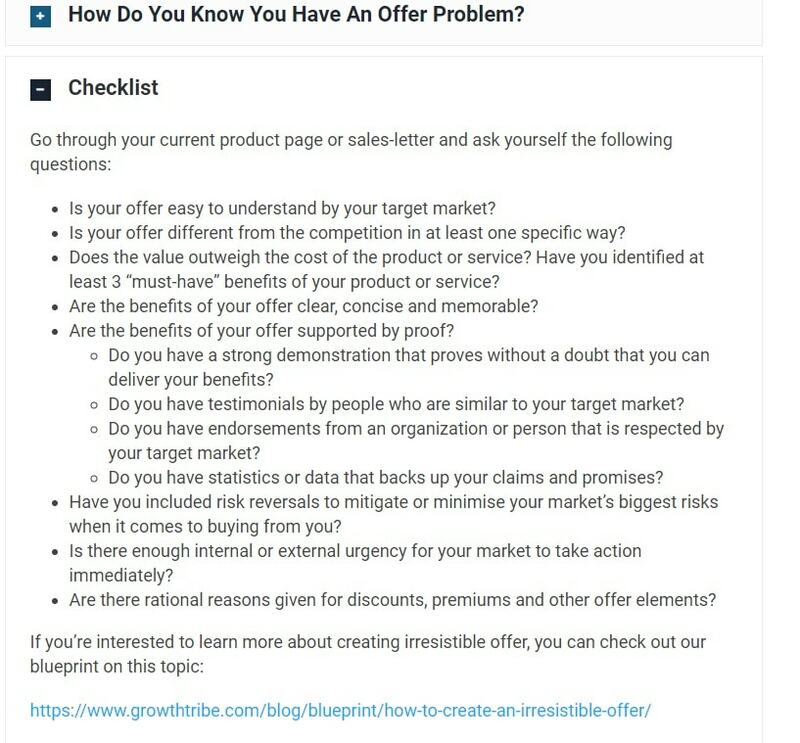 Users of this checklist can use it to diagnose most (if not all) the possible problems they might experience when they’re running your campaigns. Going back to the point that ‘everything is made of systems’, there are definitely many aspects of your business that you can systemise. One way you can approach is by looking at your business as different sections like Marketing, Operation, Financial, etc. Now that you have an idea of the type of systems that you want to build for your business, the next step is for you to understand what’s the aim of each system. After establishing the different systems and their respective objectives, it’s time for you to choose one to focus on and systemise. In order to do this, you should choose the most critical and important system to work on. It should be the system that you know will make the biggest difference to your business, depending on which stage of the business you might be in. After selecting the most critical system, you will need to breakdown your process into clearly defined steps. 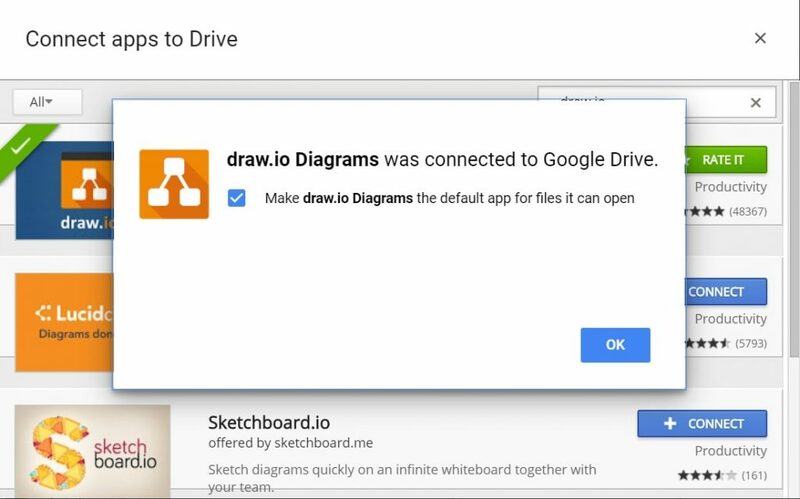 You can do this by drawing out the the different parts of the process in draw.io diagrams, an app that you can add to your Google drive. If you don’t already own a Google account, go to www.google.com and create an account. After logging in and on the Google homepage, click the grid icon and there will be a drop down menu. Click on the ‘Drive’ icon. Once you are in your drive, click on the ‘+New’ button. A drop down menu will appear. Select ‘More’. Click on ‘+Connect more apps’ and search for draw.io. You’ll see that it has been connected to your Google Drive. Click ‘OK’ and you will return to the Google drive page. Click ‘+New’ and select ‘More’ then you’ll see ‘draw.io Diagrams’. Click on ‘draw.io Diagrams’ and a new tab will open. You can drag and drop the shapes onto the grid and attach lines in between the shapes. By doing you are slowly linking up the broken down parts of your process. 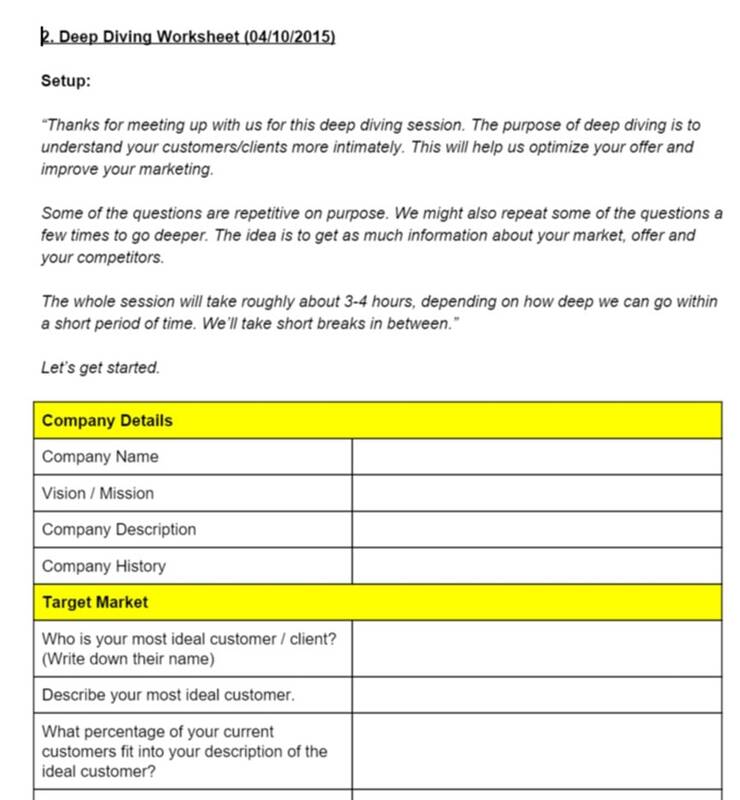 After you’ve broken down your process into clearly defined steps, you need to determine the types of documents that will be useful at each step. 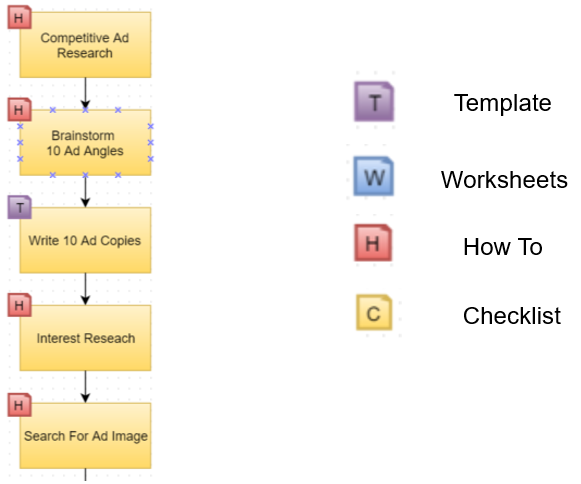 As you can see, we’ve broken down the ad creation process into a sequence of clear actionable steps. At each step, we’ve attached a document that the new team member can refer to when executing this task. This will minimise the amount of time that you have to spend to guide them personally and they’ll be able learn and apply faster too. We recommend using Google docs when you create your documents. This makes it much easier for you to collaborate with your team to create your systems. On top of that, all of your systems will be consolidated on Google drive for easy reference. From your Google Drive homepage, click ‘+New’. Select Google Docs and a new tab will open for you to create a new document. It’s important to note that documentations are useless unless your team can easily understand them and use them. Test documentation by passing it to a brand new member of the team with zero experience or knowledge in a certain step and see if they are able to execute. You can then make edits and improvements from there. You can organise your documents into folders with the templates to create systems, so your team can continue systemising for you. 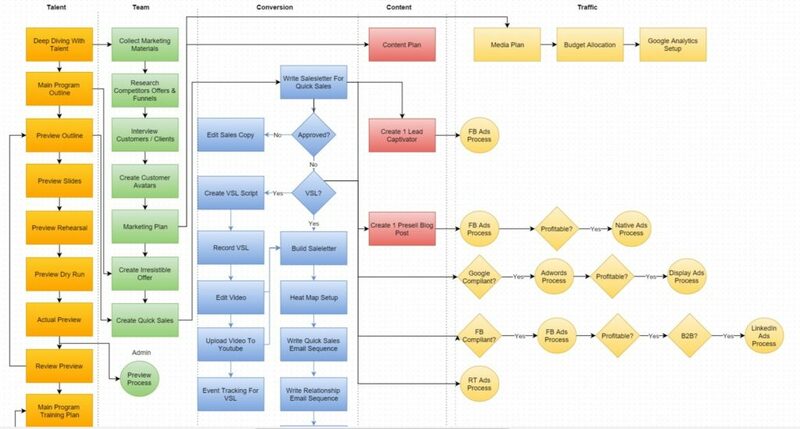 Here’s an example of how we organise our ‘Content Marketing’ system. Now that you understand the importance of systemising and how to systemise, take a look at your business and start now! Using this blueprint, you’ll be able to systemise any aspect of your business with ease. As you systemise your business, you’ll realise what type of documentation is suitable for which part of your business process. As your business progresses, you can teach your team members how to systemise so you can focus more on the strategic aspects to grow your business even more.